“I want to see as many troubled families and individuals as possible – especially people such as I, who have experienced multiple Adverse Childhood Experiences (ACEs) – have access to neurofeedback. It has changed my life by changing my brain. I grew up in a horrific situation, never able to trust being safe. Stress would take me back to that childhood place of feeling terrified. Neurofeedback helped me become more rational, as my brain was trained to function with less stress. Now that I am not in constant panic, I can see the parts of our lives that are not going the way we want them to go and can look at these challenges with clarity and openness instead of fear and blame, shame, or guilt,” says Stacey Breitmann, trauma survivor, mom, military wife, and neurofeedback advocate. 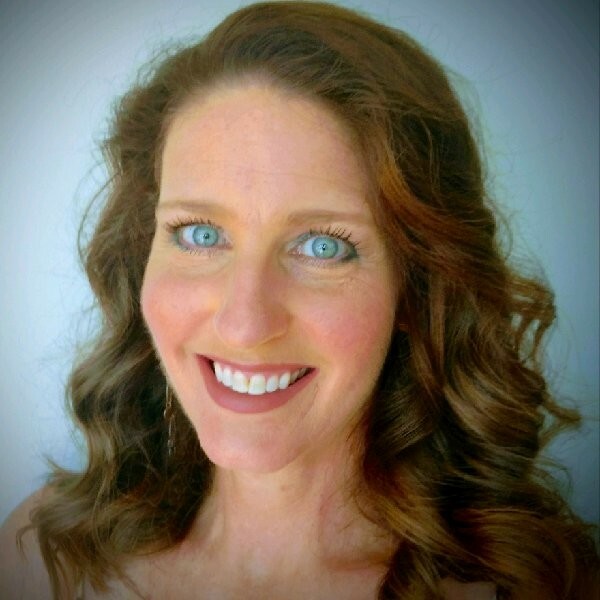 Stacey Breitmann, trauma survivor, mom, military wife, neurofeedback advocate and coach. Todd Breitmann, USAF retired, prepares for a neurofeedback session with daughter Hailey in the family’s brain training room. For the Breitmann family in North Georgia, the last few years have been intensely stressful. Todd, a Lt. Col. in the Air Force for 24 years, retired in 2012, and fell into depression and anxiety when his military career came to an end. In an attempt to change the mood by changing the focus and location, the family bought a farm, sold it, tried life in a Winnebago for a couple of years while homeschooling their daughters on the road. Finally, when they settled in North Georgia in 2016, family stresses and Todd’s depression became so crippling that he became suicidal. Residential treatment seemed to be the best option. In Todd’s absence, his wife Stacey did what good military wives do: She ran the household – as the mom and the dad. But the stress of being left behind this time were life-threatening for her too. Her fears that Todd might take his life during treatment drove Stacey beyond depression into being suicidal, too. “His being in treatment 30 miles away was harder than his being deployed overseas. I was worried on so many levels, about our marriage, his depression, his suicidality. I worried about our daughters and how all of this was affecting them. It was as though I always had way, way too many tabs open on my brain. It was a computer that was freezing up and crashing as I tried to do homeschooling, care for a big house and property, figure out what was happening with my husband and my marriage,” said Stacey. The Breitmann’s 16-year-old daughter Hailey carried a heavy load of stress as well. At an early age Hailey was diagnosed with Asperger’s, which is on the autism spectrum. Homeschooling had helped, but her wanting to be around other young people was creating social anxiety. She had fallen behind in school and was taking three medications to help with depression and anxiety. Meanwhile Breitmann’s older teenage daughter was clashing with her parents over wanting more and more freedom. She was also on antidepressants. She knew she had deeply disappointed her parents by moving out and walking away from school, her church, and her family. Stacey worried about the relationship this daughter had with an older man. The hostility between Todd and his firstborn was palpable, sparking her decision to move out, which added to his sense of loss, depression, and hopelessness. A break in the family tension came when Stacey decided to take Hailey for neurofeedback training in a nearby town. “I spent a fortune, but I knew after 10 sessions she was better,” said Stacey. Hailey continued the training and completed 20 sessions. By the time she was finished, she was off of all medication. 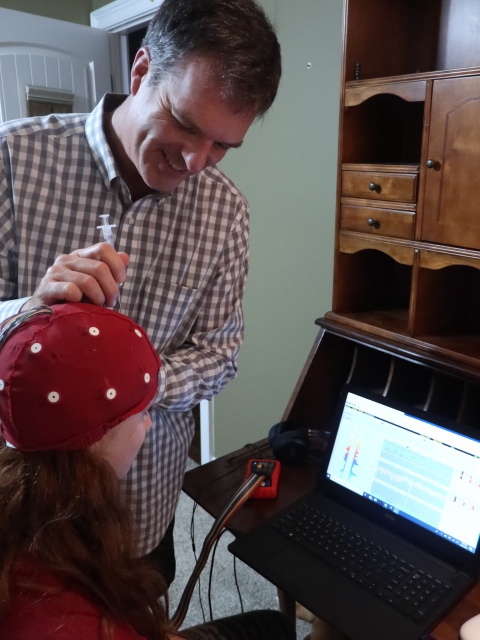 Stacey wanted to learn more about neurofeedback and consulted a physician friend who told her about the neurofeedback system she was checking out for home use. As soon as Stacey learned about the system, she ordered the hardware and software package herself. “I bought our system when Hailey was almost finished with her sessions. Her improvement had been miraculous. She was back at grade level. I decided it was time for me to give neurofeedback a try, so I began training on myself with the Brain-Trainer system in April of 2018. Within nine sessions I could tell a major difference. “It was as though all the obsessive thoughts and anxieties that had been swirling around in my brain slowed down, drove into a garage, found a place to park, turned off the engine, came inside, and relaxed in a warm bath while I listened to spa music. It wasn’t that I quit being concerned about the challenges. It was that I was able to come out of being overwhelmed. With the anxiety and depression gone, I started to think clearly. I could tackle tasks without dreading them. My mood brightened. I felt better about myself. I was not terrified about what would happen when Todd came home, because I knew that if neurofeedback could help Hailey and me, it could also help him, and our older daughter,” said Stacey. By the time Todd was home to stay, the family was in a completely different place emotionally. Their older daughter had also started neurofeedback, and was enjoying her visits home for the training. She, too, was tapering off of antidepressants. “Coming into a happier family, after having been gone for almost nine months, was an incredible relief,” said Todd. “I had done a lot of healing on my journey. And the work Stacey had done, with her own counseling and the neurofeedback, helped her to be more open to my coming home, to our being on the same team. Now she doesn’t assume the worst. Together we can process the facts and if things get a little tense, we can take a break instead of hurting each other. The differences in her, in her confidence and problem-solving abilities, are miraculous. “Seeing Hailey literally blossom into a happy teenager who doesn’t have to take medication for anxiety is an answered prayer. It used to be that we would need to push her out the door. Now she is engaged in what she loves; seeing her interact with people – with so much less fear – is wonderful,” continued Todd. It didn’t hurt that Todd, too, had started neurofeedback. And that he was soon hired for a job helping other veterans with securing healthcare benefits. Stacey has become a strong advocate for educating people about ACEs science, and for neurofeedback, which she says literally helps the brain build new connections at a higher level of functioning. “This is the brain helping the brain,” she says with conviction. “There is nothing going into the brain,” she explains. “Neurofeedback simply measures brainwaves while the brain is engaged in processing what is seen and heard on a computer monitor. When brainwaves measured are not fluctuating wildly, or in a ramped-up zone where anxiety is likely, music and visuals on the computer screen during training continue. If the brainwaves become erratic, or too fast or too slow, the music and the visuals stop. In this way, for the brain to receive what it wants – the visuals and the music (which can even be a movie, something from Netflix, or cat videos, as the person receiving therapy chooses) – the brain trains itself to function at a more efficient, less erratic level,” she said. Brain waves are measured by sensors on the scalp, in sessions that are planned with the help of a QEEG (quantitative electroencephalography) exam, the standard for use in measuring brainwave activity and planning a neurofeedback protocol. Stacey explained that the program she is using is more than traditional neurofeedback, because it uses another training modality. Stacey has become such an advocate of neurofeedback that she has written a training manual she believes can be used by anyone, and recently gave a talk about her experience with neurofeedback to a group of women in Florida. “I want to see as many troubled families and individuals as possible – especially people such as I, who have experienced several Adverse Childhood Experiences (ACES) – have access to neurofeedback. It has changed my life by changing my brain. I grew up in a horrific situation, never able to trust being safe. Stress would take me back to that childhood place of feeling terrified. Neurofeedback helped be become more rational, as my brain was trained to function with less stress. Now that I am not in constant panic, I can see the parts of our lives that are not going the way we want them to go, and can look at these challenges with clarity and openness instead of fear and blame, shame, or guilt,” she explained. From military wife, homeschooling mom, and Sunday school teacher to ACEs Science and neurofeedback advocate isn’t a far stretch, Stacey explains: “When our brains are functioning better, we function better. It is that simple. There is so much stress and negativity in the world, it is little wonder that so many people feel anxiety and depression; that’s why so many people also contemplate suicide. “ACEs science explains why some people are so much more stressed, depressed. Neurofeedback is a solution that lasts. It helps people get off of costly medications that also come with unpleasant side effects. Neurofeedback has been around for 50 years. It’s been proven safe and effective. I found that I didn’t have to know anything about neuroscience to do this. The training plan that comes with the equipment we chose tells you exactly what to do. It is like following a recipe. I trained myself and it was miraculous,” said Stacey. The system they use is called Brain-Trainer. Viloria is enthusiastic about the results of NFB done with family involvement. “More often than not, the child is the identified patient and the primary participant in treatment. However, we know that a key factor in protecting against or reversing the effects of toxic stress on a child’s developing brain and body is by having a responsive, buffering caregiver,” she explained. “Neurofeedback can help children and teens learn how to better self-regulate by gently nudging the brain out of old habits and teaching it new patterns and ‘tricks’. However, it is also important that these new patterns and tricks are reinforced in the home. We cannot only depend on the newly regulated brain of a child to hold strong if he/she then returns to a dysregulated household or family system. Engaging both child and caregiver in multidisciplinary services will have the most impact. Brain training for the family opens up the possibility for co-regulation, as well as a shared language and understanding of brain function.